Totapuri Mango is the famous mango found primarily in Andhra Pradesh. 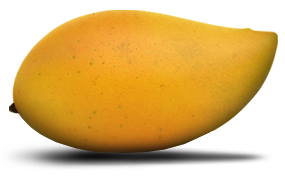 The Totapuri Mango is also grown in the Indian States of Karnataka and Tamil Nadu. These mangoes are large in size and golden yellow in colour. It is oblong in shape and has a prominent beak-like pointed end. These mangoes vary in length but are generally about 7 inches long. The skin of the fruit is usually thick and the colour can vary from green to yellow. This variety of mango is known to contain nutrients, such as vitamins A, E, C & B5 and is an excellent source of Vitamin A and C. Some of these vitamins are good for adding a glow to the skin and its antioxidant enzymes provide nourishment to body while increasing resistance power. The product is derived from fresh, sound ripe, Totapuri Mango fruit (Mangifera Indica L Anacardiacae VAR Totapuri). Firm Fully matured mangoes are harvested, quickly transported to fruit processing plant and inspected. Selected high quality fruits go to the controlled ripening chambers and allowed to ripen. Fully ripened mango fruits are then washed ,deseeded, pulp extracted, centrifuged ,thermally processed and aseptically filled by HTST process into pre-sterilized bags or OTS cans which are hermetically sealed processed and cooled. Uniform, homogeneous, smooth, free from fibers and any foreign matter. Characteristic prominent aroma of natural ripe Totapuri Mango, free from any fermented & off flavor and scorched or caramelized flavor. Characteristic typical sweet acidic taste of natural ripe Totapuri Mango. Free from any off taste. "Commercially sterile", free from bacillus, osomophilic yeast, coliform and any other pathogenic microorganism and fit for human consumption. Product is free from added sugar, dyestuff, synthetic flavor, stabilizers, pesticides & herbicidal residues and radioactive contamination. ‘Good Manufacturing Practices’ is applied in the manufacturing process to meet the laid down given standards as per HACCP by ISA Cert B.V Netherlands, SGF (SGF International E.V) and ISO - 9001 (AQA International). Jus! Aseptic fruit purees are available in (215 +/- 2 kgs) bags in drum. Aseptic fruit purees are filled on US-FDA approved aseptic filler into pre-sterilized, high-barrier bags placed in steel drums internally painted with food grade lacquer and drum tightly closed to ensure no free space inside the drum. Jus! Canned fruit purees are available in size A-10 OTS cans (3.1 =/- 2% kgs) and such 6 cans in one carton. 6 x 3.1kgs A-10 size cans in one carton and 1000 cartons in 20 ft container. Stored in ambient temperature in cool and dry place. Jus! Aseptic and canned fruit purees can also be supplied as per customer’s specification. Dairy: Milkshakes, Ice creams, yoghurts, toppings, desserts. Others foods: Fruit juices, jams, Mixed fruit juices jellies, strained fruit drinks, Squashes etc.